Fantasy betting is a big deal in the US, but not so much in Europe yet (most likely because sports betting is not illegal in Europe). I like the community aspect of fantasy betting so much that I decided to devote a page on the pokerbankrollblog entirely to Sports and Fantasy betting. My favorite fantasy betting site is Drafbug.com and for this reason I recently decided to become an affiliate and start promoting the site. The people behind Drafbug have written a thorough description of what Drafbug is all about, how to sign up and how to play in their contests. Read it through if you are interested in fantasy betting and post a comment if you have any questions. Draftbug offers daily fantasy sports contests, where you pick a roster of players for the current day’s games, and win or lose based on their performance that day. Registration is free and only takes a minute. 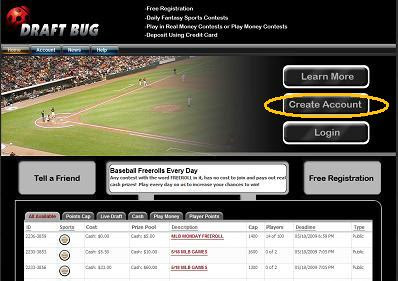 You can play for free, and win small cash prizes, in our daily baseball freeroll. Once you’re ready to play for higher stakes, you can use your credit card to make an instant deposit. 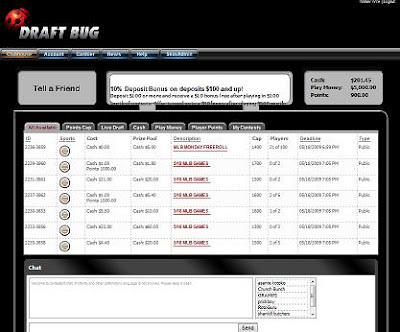 After you’ve made a fortune in Draftbug contests, you can receive your withdrawal via check. 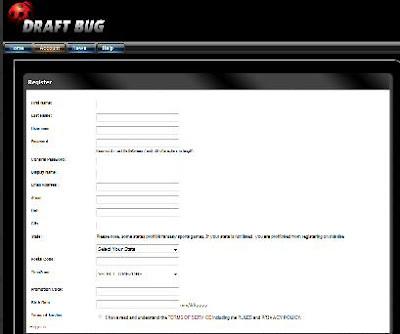 How do you sign up for Draftbug? You’ll need to fill out the requested information, and then click the “Registration” link in the lower left corner of the screen. You now have a Draftbug account, and will find yourself logged into the site and viewing a list of currently available contests. How do you play in Draftbug contests? The main, tabbed panel of the screen shows a list of the contests that are currently open for entry. From left to right, the columns show a unique id number, the sport, the entry fee, the total prize pool, a short description of the contest, the salary cap for the contest, the number players currently entered and allowed to enter, the deadline for entering the contest or making roster changes, and the type of contest (usually ‘public’). The top left section shows roster requirements for the contest. By default, this will be a 1B, a 2B, a 3B, a SS, a SP, a RP, and 3 OF. The top middle section shows which games are included. Some contests will only use night games, while others will use all games. Typically only the second game of doubleheader will be used. The upper right section shows contest prizes. The lower left section shows scoring rules for the contest, while the lower right shows who has already entered the contest. The upper section shows the positions available for the contest. The position highlighted in green is the one that you’re currently selecting. If you want to skip to another position, simply click on it. 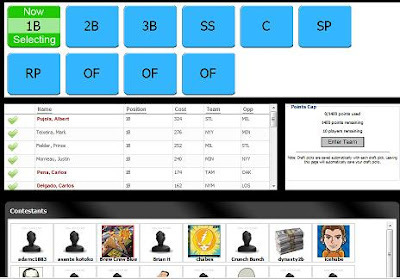 The middle, left section shows the players available at the current position, and their prices. If you have enough salary remaining to select a player, there will be a green check mark to the left of the player’s name. To select the player, click on the check mark. When you’re done picking players, click the “Enter Team” button on the right side of the screen. You can come back to this screen at any time prior to the lineup deadline (which is usually a few minutes before the scheduled game time), by going to the “My Contests” tab on the main Draftbug screen, and clicking on the contest description. Once the deadline has passed, you can view your opponents’ picks and live scoring by going to the “My Contests” tab on the main Draftbug screen, and clicking on the “View Results” hyperlink. If you any questions whatsoever about the sign-up and contest procedures at Draftbug, please let me know. Keep in mind that fantasy betting is legal in the US meaning that deposits and withdrawals are a lot simpler. I’m not sure if this is sustainable, but I’ve got a 24.8% ROI in about 150 Draftbug contests so far.